Tips, advice, and resources on the art, craft, and business of writing and the writing life, via personal experience, author interviews, guest bloggers, link round-ups, and more. Much of my teaching of writing work is grounded in creative nonfiction, and especially writing memoir. In workshops and classes, we never run out of topics that are worth thinking about, discussing, studying in published works -- and sometimes, complaining or venting about! Into that last category so often falls the subject of memory and how often we are vexed and perplexed by its unpredictable nature. One day, we sit at the keyboard or notebook, and our fingers fly, fueled by churning, detailed memory that seems almost unstoppable, offering up voluminous details, vivid visuals, sharp and full lines of remembered conversations. We recall with certainty the weather on a particular day, the clothing we wore, the way a loved one cocked their head, the inflection in their voice. Without thinking almost at all, we're describing the furnishings of a room down to the smallest bit of bric a brac, what the house smelled like, the lilt of a particular birdsong that drifted in an open window. The way we felt, what we thought, our hopes and fears at that moment in past time are as close and clear as if it all occurred yesterday. And when that happens, bliss. Memoir seems to write itself. Then, there are some other days. Or perhaps I should say, most of other days. The memoir writer's page remains blank, not for lack of ideas, but because those memories float just out of reach. We remember some of the event, but not all. We can't be sure if so-and-so said this-and-that, and if they did, was it in fact, on that day, at that moment? Where, exactly, did the interaction take place after all? And was it before or after some other event? Elusive, spotty, incomplete memories are something with which every write of creative nonfiction -- memoir, personal essay, nonfiction narrative -- must learn to cope. Recognizing the fallible, hazy, unreliable nature of memory has caused many a memoir writer to push their project to the back burner, or abandon it completely, in the belief that memoir writing is reserved only for those with a stellar memory. 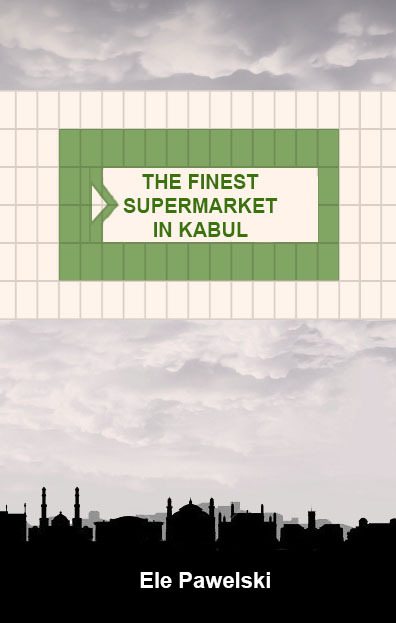 To which I say: nope. 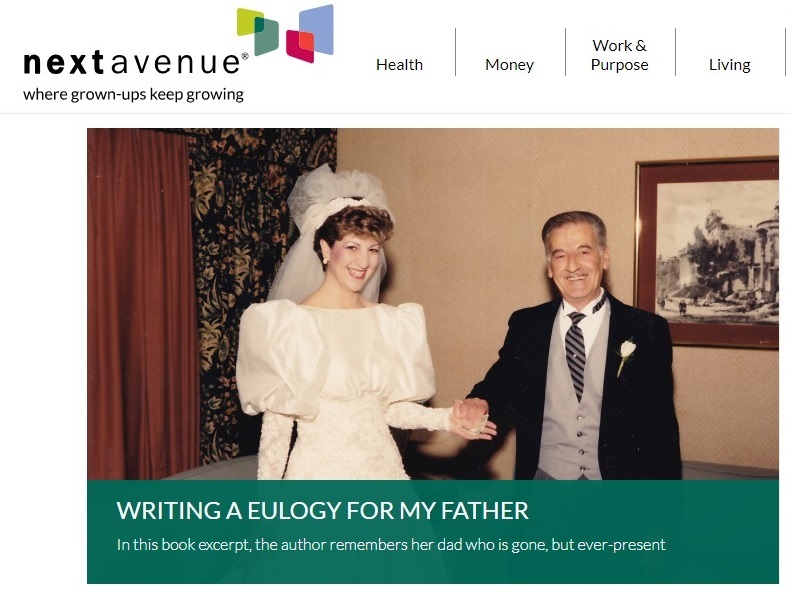 Yes, you can write memoir, even if your memory isn't great. 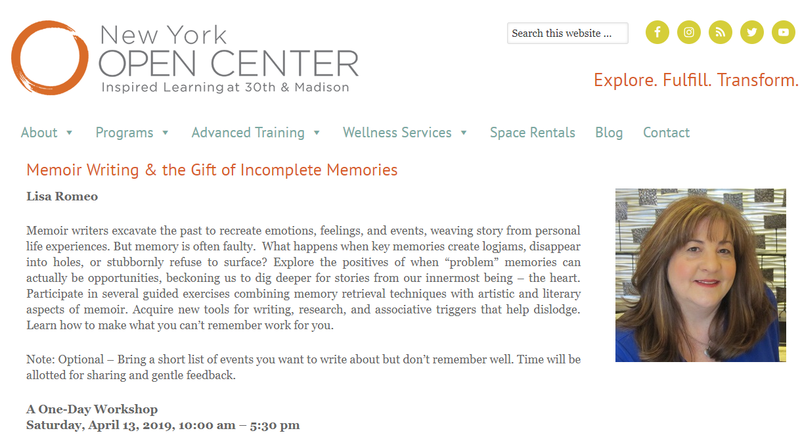 And if exploring the relationship between memory and writing memoir is of interest, I'd love you to consider my day-long workshop on the subject at the Open Center in Manhattan on Saturday, April 13. To say that the first six months after one's debut book is published are a whirlwind would be an understatement. For me, these months have been filled with so many wonderful experiences and events, new people and opportunities, a better understanding about the publishing world, chances to share insights, and much more. The feeling which lingers most though when I look back -- as I did recently -- is one of gratitude. 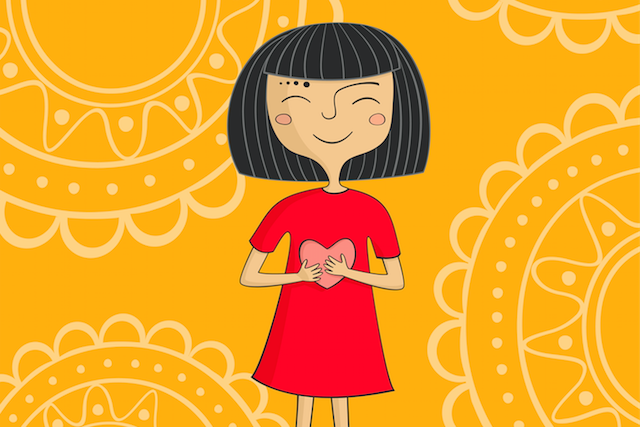 Hence, the heading for my recent newsletter: Starting With...Gratitude. Since some blog readers may not be on the newsletter mailing list (and you can fix that here), I wanted to let you know that you can read the newsletter at this link. Even better, if you haven't gotten a copy of my book yet, until the end of the day on Dec. 9, there's a giveaway going on (via the newsletter) for a signed copy (AND a separate giveaway for a bundle of writing craft books). 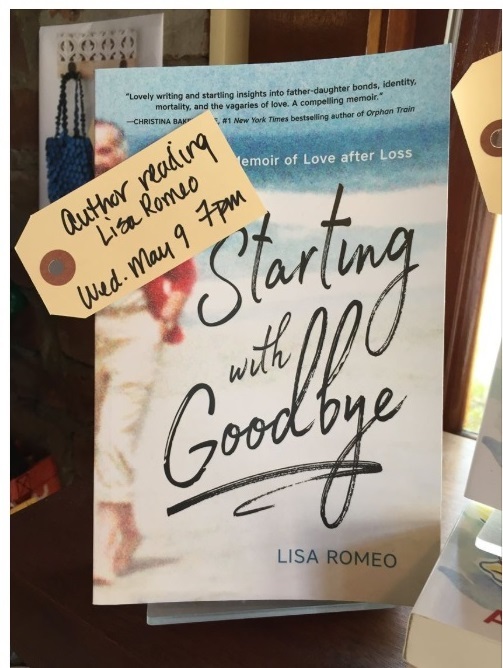 Details are in the newsletter (and since you won't be able to reply there -- as the giveaway instructions state -- you can enter one or both by emailing me directly: LisaRomeoWriter at gmail dot com ). One of the most enjoyable ways I meet other writers is at small conferences, often over a meal, and one topic that often comes up is how we all make a living while chasing writing goals. That’s how I met Jane Paffenbarger Butler and learned about her unique job—which I’ve invited her to write about here. Jane has degrees in pharmacy and health systems management and worked in clinical research. 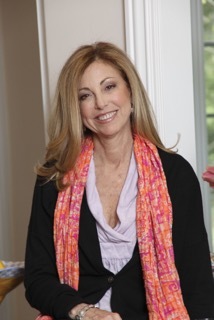 While raising three children, she wrote in fits and starts, but then got serious, joining the Brandywine Valley Writers Group and Main Line Writers Group. 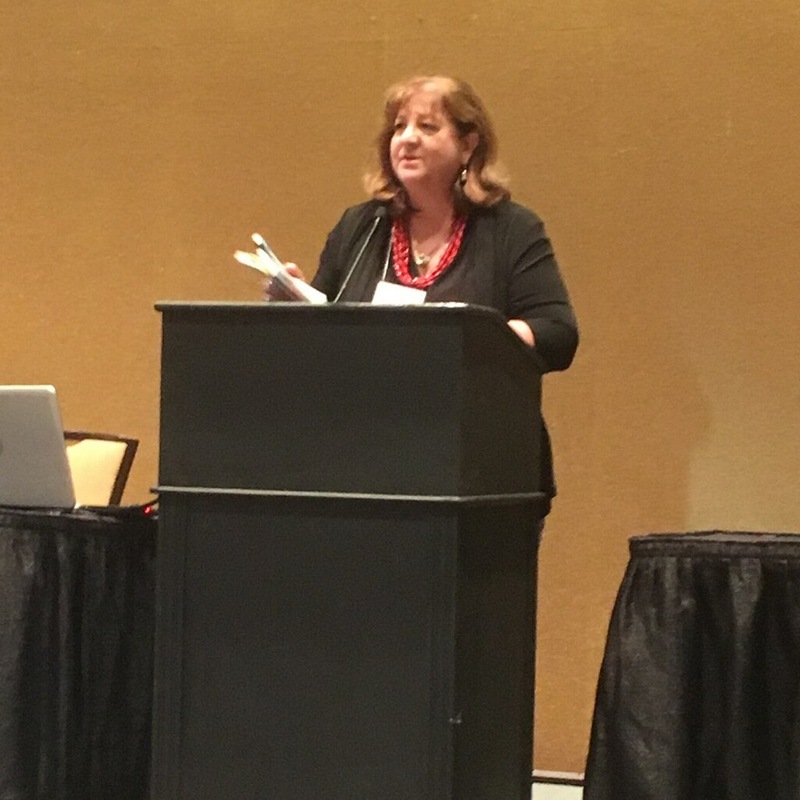 She’s at work on a memoir, You’ll Get Over It, Jane Ellen.An excerpt placed second in nonfiction at the 2017 Philadelphia Writers Conference. 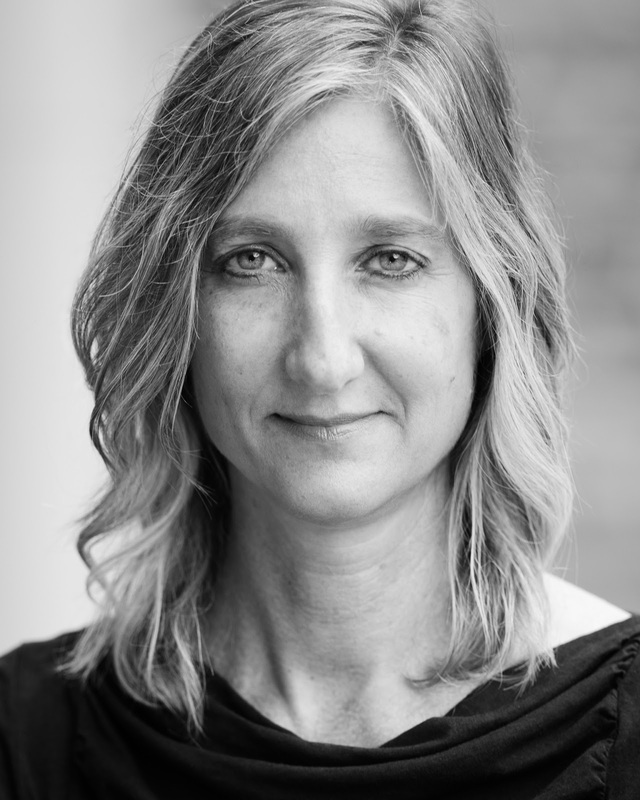 Her work has also appeared in the anthology Unclaimed Baggage, and in the Philadelphia Inquirer. She’s the 2016 and 2014 winner of the West Chester Story Slam. Please welcome Jane Paffenbarger Butler. Most days, I adore my job. 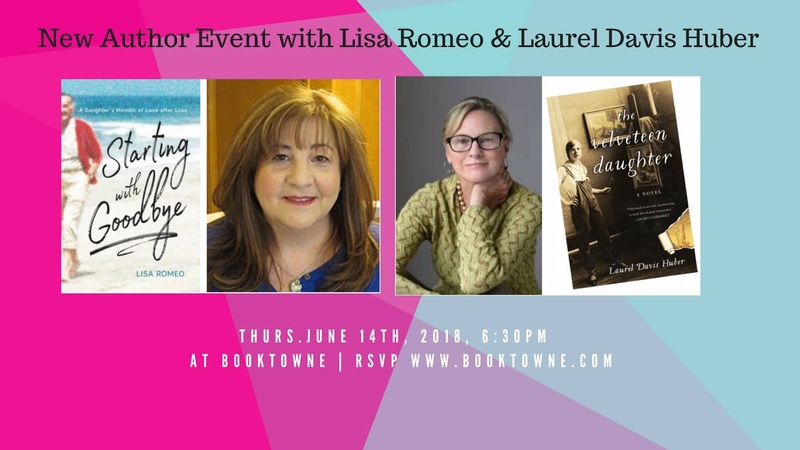 I am talking about the one where I get to go to my local high school and hang around the English classes talking to kids about their writing. Today, for example, a steady stream of students visited me; some wanted to discuss what to write in their comparative papers on Wuthering Heightsand Dante’s Inferno, others needed help proving a point made in Merchant of Venice. It may sound pretty high brow I know, believe me it is not, especially for someone like me who is a pharmacist by training. But the same dynamic occurs whether the students and I are talking about Shakespeare or the Sunday comics. The focus is on art and on the act of responding to it. Other days, in other classes, I work my way around the room asking each student to tell me their ideas for assigned poetry, memoir, or short story projects. I tell them that ideas mellow and age and do not usually spring to the page fully formed. I tell them that it’s okay, in fact it’s preferable, to get started by just writing in stream of consciousness. My title is Theme Reader, and I support the work of a high school English teacher by reading and commenting on each student’s writing assignments. Yes, it is a support role, and it is a peach job for someone like me, an aspiring author. This is a teaching job with none of the strings attached. I meet no parents, give no formal grades, and discipline no one. Instead I am a writing coach, and my time is spent reading teenage students’ work and talking to them about the craft of writing. I am also paid to sit in on the viewing of classic films and TED talks, and get to stay in tune with young people who gladly explain to me such mysteries as gifs and K-pop. And what could be better than sitting in on a discussion of Faulkner’s As I Lay Dying or Twain’s Huck Finn? Or reading twenty-five papers from the AP Literature students who each select, from a lengthy list, a different classic novel to analyze? Often, the students’ detailed breakdown of each book is so complete, by the time I review and offer comments on their projects, it feels as if I’ve just read the book myself. Sometimes, in classes where students are not as motivated, it is my duty to inform them of the power of words. That words can be a tool by which we get what we want out of life. I help them see that learning to use words to their advantage could be a way to get out of bad circumstances, a way to rise above people who make life difficult, and a way to work through issues that are hard to manage. Words are power. I love helping them learn how to understand, harness, and wield that power. In Creative Writing, an elective class, students arrive not as hostages but as volunteers, open to my crazy suggestion that we daydream a little about what it means to be human. With the whole world as fodder for topic, I help students zero in on what their own voice yearns to say. This year I am meeting with an independent study student weekly to work on her novel. The notes I took recently on Robert McKee’s Story, Blake Snyder’s Save the Cat, and Stephen King’s On Writing: A Memoir of the Craft, while trying to elevate my ownprojects, have become perfect resources for our work together. Sharing such material conveniently reinforces my personal goals, too. When I was a Clinical Research Monitor at a pharmaceutical company, among my many tasks were study reports and protocols, and I excelled at ensuring the internal consistency between tables and charts and between statistical facts and stated conclusions. I yielded the red pen as editor for a 400-page New Drug Application Summary submitted to the FDA, based on data from hundreds of patients. At my interview for the Theme Reader job, I explained that although I wasn’t a certified teacher and had no degree related to language or English or anything one might suspect relevant (and which the job specs listed), I love teaching and students and the English language. I handed over the bound New Drug Application Summary, the thin manuscript of my memoir, mentioned my membership in local writing groups and my participation in writing conferences. They hired me on the spot. That was ten years ago. 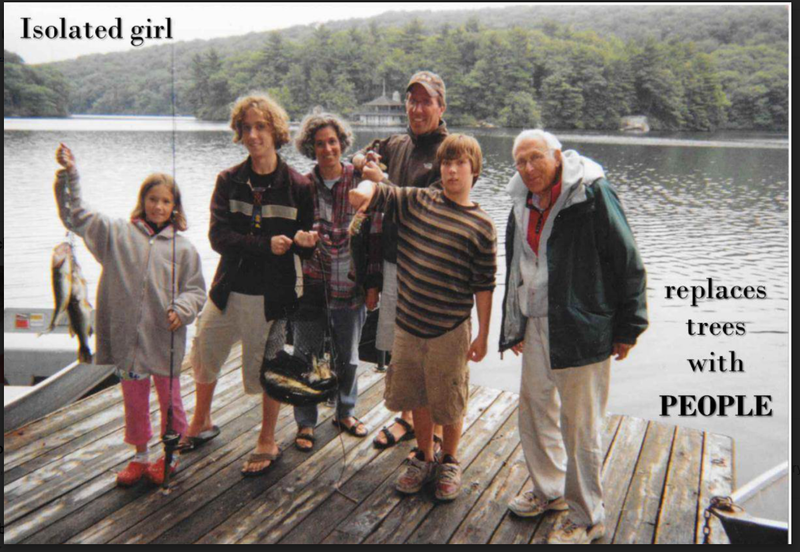 One of Jane's six word memoirs. The best part about my job is that I must show up every week and pay attention in class. This time around I am personally interested in what makes for a good story and what constitutes a rhetorical device. My job requires me to say out loud the facts I know to be true about writing, to sit alongside students and reconsider the masters, to teach patience and taking risks on the page, and to learn, learn, learn. To top it all off, I even get a paycheck. Get to know more about Jane at her websiteand blog. 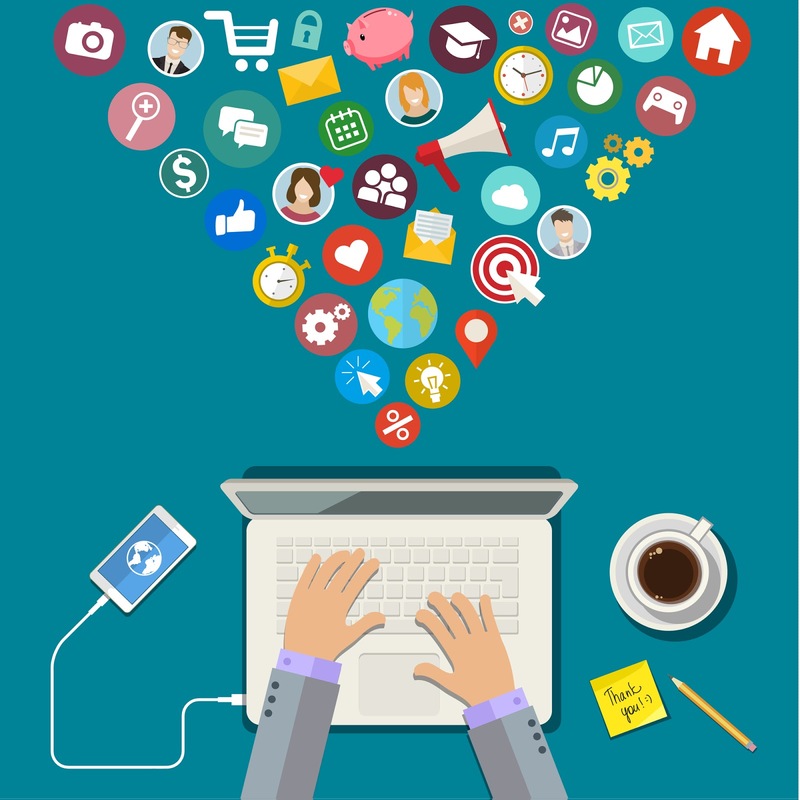 One task of a new author is to help generate positive online coverage/mentions of one's new book. Some are less within the author's control than others of course, and some are more fun than others. 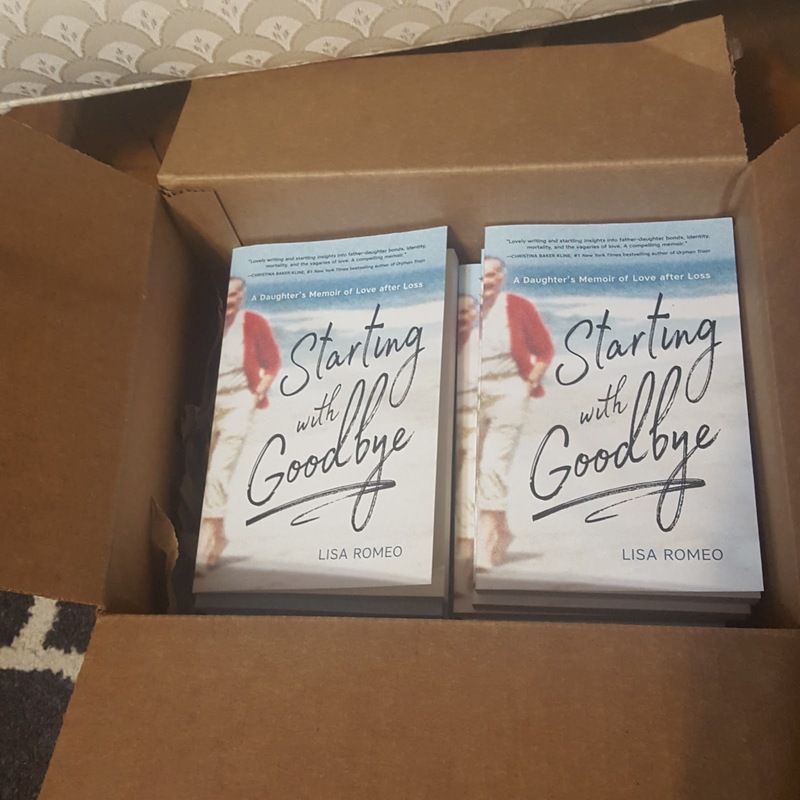 Since spring (coinciding with the release of Starting with Goodbye from University of Nevada Press) I've been writing guest posts and answering interview questions from literary journals, bloggers, reporters and freelancers. Mostly, I've had a great time. I'm still having a good time. 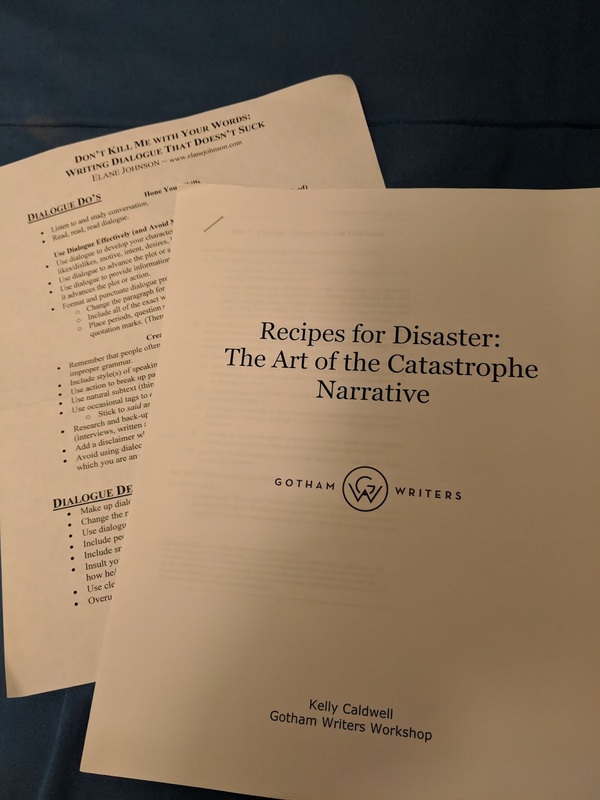 While the goal is to keep the book in front of people's eyes, one of the more satisfying side benefits for me has been that many of the resulting pieces double as useful tips, advice, and information for other writers. 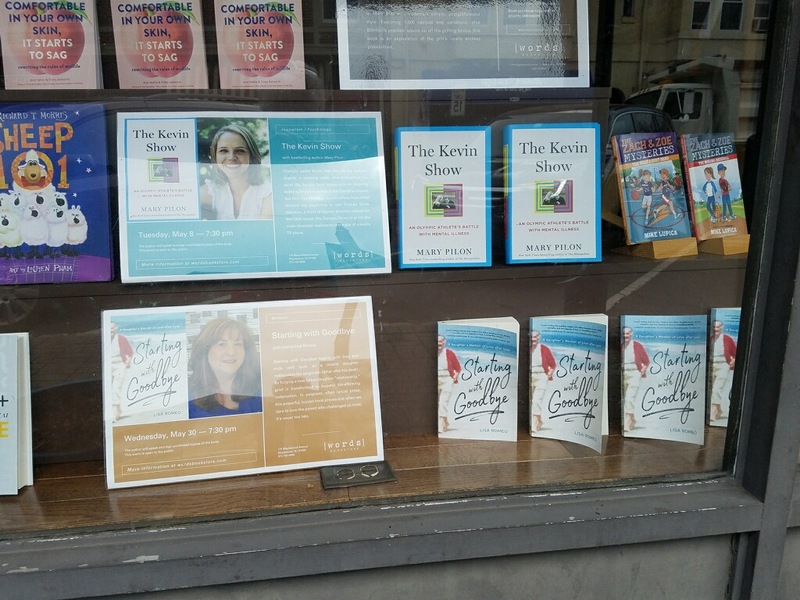 The book launch, book tour, and general book promo craziness dominated my days for months, meaning I didn't have time to keep offering writing thoughts here at this blog, so whenever possible, I tried to tie in book publicity with literary citizenship. I hope some of these will prove useful for your own writing practice, writing life, writing challenges. As book mania settles down, I hope to be back here at the blog more regularly, with the spotlight once again trained on passing along good writing life advice and lessons learned from experience -- mine and others'. 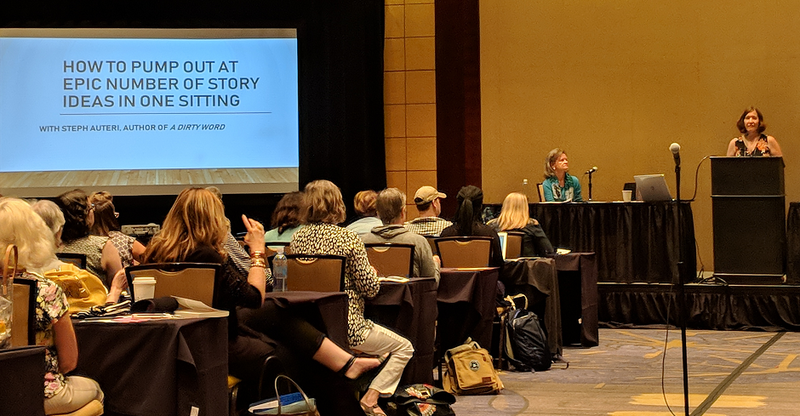 When this blog was an infant, I ran some posts summing up advice and insights I’d returned with after attending a writing conference, residency, or similar gathering. 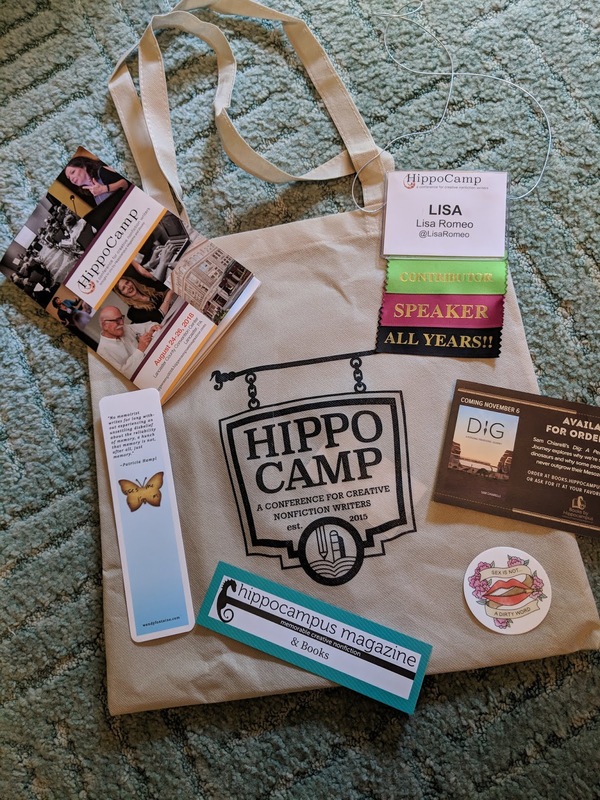 I thought I’d revive the tradition, because this past weekend, for the fourth year in a row, I was at Hippocamp: A Conference for Creative Nonfiction Writers, in Lancaster, PA. Since its inception, I’ve been an enthusiastic supporter of Hippocamp, which is put on by Hippocampus Magazine, a rather nice and well-respected online literary journal. This smallish conference continues to be a particularly loved favorite of mine for so many reasons, checking the important boxes I tick off when deciding on attending a writers’ conference. As usual, I tried to get to all the breakout sessions, panels, and special presentations that sounded of particular interest to me. And as usual, I failed, because with so many promising concurrent offerings, it’s just impossible. So, I’ll be watching, myself, as post-Hippocamp coverage begins to emerge, as it usually does on others attendees’ blogs and writerly websites. Meanwhile, here’s a peek into some of what made it into my notebook, though much more is rattling around my head, my heart. I took a pre-conference workshop with writer and journalism professor Wendy Fontaine on “Using Brain Science to Write Memoir.” I teach a memoir workshop on integrating memories into memoir, and how to transform elusive, uncooperative memories into nonfiction prose—but this was a terrific chance for me to learn how and why our brains actually handle memory. I know this will not only expand what I can share with students in the future, but that it also opened doors and windows to my own understanding of why humans do and don’t remember, and how that impacts writing.
. I already knew that smell is the strongest and most powerful memory trigger (yes, more than music), but now I know why. It’s because the olfactory center is located in close proximity to the hippocampus, the place in the brain that files, retrieves and makes connections between memories.
. Some things that occurred are never recorded in memory, so even if we know we were present when X happened, it’s possible our brain never encoded X. All the trying-to-remember gymnastics just won’t work. 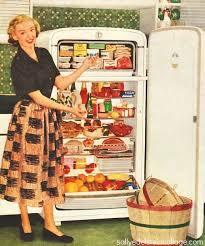 Some would-be memories really are “lost”.
. What my husband calls “revisionist” history is a thing. 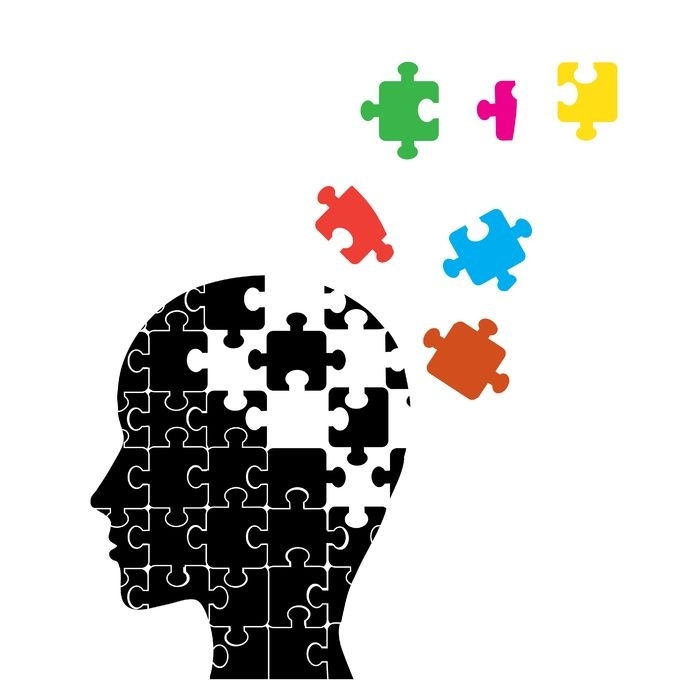 A thing called “memory source confusion” – when we substitute what makes sense for what we can’t recall.
. Dialogue must be true, meaning it must match the character, personality, education, of the person speaking.
. Remember to show how a (real) character may talk differently when in conversation with different people.
. Keep in mind, the (real life) protagonist(s) has a goal to reach both during and after the catastrophe. During a freelancing panel, Estelle Erasmus offered this deceptively simple checklist for a pitch: “Why this? Why now? Why me?” and added that the “Why now” should include some data, stats, trends or other information that’s brand new.
. What have I experienced that others might want to know about?
. What do I want to know about?
. What’s in the news that I can comment on?
. What new stats or studies can I say something about?
. What in popular culture—movies, TV, books, etc.—am I excited about and can comment on? One thing that really stuck with me (and I’m paraphrasing her first sentence): We worry when writing memoir that others will say, who cares? That’s it in a nutshell, no? Meanwhile, what have you been inspired by, intrigued by, captivated by recently at a writer gathering? When I began featuring guest bloggers, Debra Borden was one of the first I invited, after meeting at an event for writers in northern New Jersey. 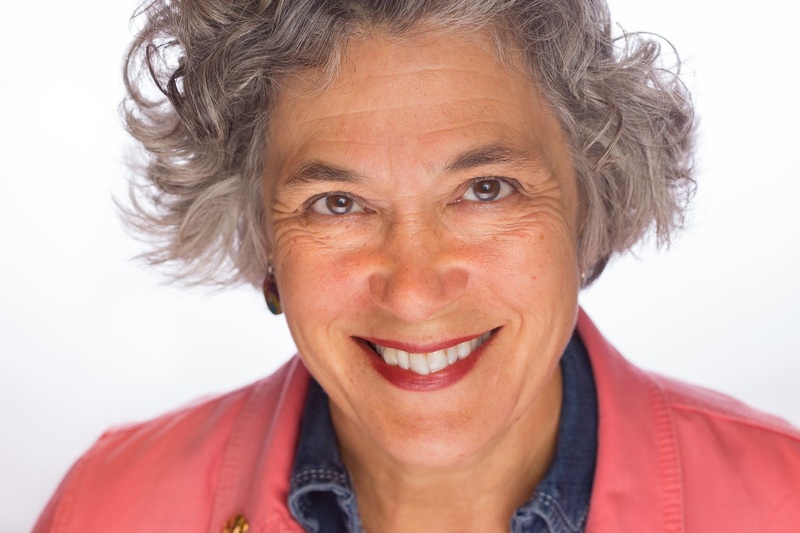 In addition to writing, Debra works as a Licensed Clinical Social Worker in New York and New Jersey, helping clients in a variety of settings, including as a “Sous Therapist” in their homes. 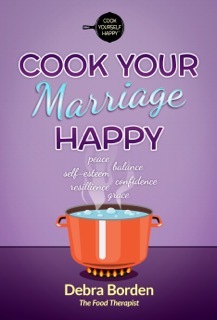 Cook Your Marriage Happy, the first in her planned Cook Yourself Happy® series, is her third book, following the novels A Little Bit Marriedand Lucky Me. At the time, I didn’t realize that the essays might also be transitional. But as an LCSW I know something about the wordcompulsion. I’ve used it to describe clinical features as well as what writing is to me; with a nod to Descartes, I write, therefore I am.